"In the beginning of The Truman Show, Truman is just outside and all of sudden this theater light crashes to earth and lands in the middle of the road. It was a hint. And that is what happens as we go on the spiritual journey. We get more and more clues and hints that things are not what they seem to be." The world was a show produced and directed by the ego. It employed many actors, used many sets and events on a time-loop, and depended on sales and labels and product placement to sustain itself. The show aimed at drama, repetitions, distractions, pretense, and ultimately resorted to fear to perpetuate itself. For, being make-believe, it had to be believed as real to seem to continue. Once the show is seen as nothing but a contrived skit of past memories, the show no longer seems to be reality. Once you see the show from the fearless perspective, the show is effectively over and done. Fear has been exposed as unreal, and all the characters and sets are therefore without meaning. You are the light of the world. Who you are, Spirit, is the meaning of life! Our Kingdom is not of this world! When you try to pull your mind from the ego, it feels the threat. Truman has finally faced most of his fears, including his fear of the water, and as he goes for the escape door from his world, the ego goes from suspicious to vicious. The ego doesn't mind if the body lives or dies, so long as the mind doesn't discover that the whole world is part of a charade designed to keep us from knowing our true awareness as Spirit. A big part of the spiritual journey is disillusionment with the world, including friends, family, success, even time and spiritual practices. When Truman hits the edge of the entrapped world on the sailboat, he initially feels anger at being tricked, but then he becomes aware that it's an artificial world. The staircase he must climb to escape is disguised and only visible when he has stepped away from the mesmerism of the world. At the top of the stairs, the ego makes one last-ditch attempt at trying to persuade Truman to stay because it will be out of business if he goes out the door. Everything in The Truman Show is a big setup to keep Truman locked in this idealistic world. On the surface, Seahaven seems pleasant and nice, but there's a lot of fear underneath. That is what this world is. It was generated by fear. Love doesn't make the world go around; fear and guilt make the world go around. Gravity can be a grave law when you have a fear of crashing and you are up in an airplane and the engine quits working. Fear and guilt are behind all of the laws of nature. As Truman gets closer to the escape door for walking off the set, Christof (or Christ-off, the ego character) tries, in the last second, to build Truman up as the star of the show to get him to stay. But Christof is speaking of Truman's body as the hero, not Truman's mind. As long as the mind stays identified with the hero of the dream, the body, it will be afraid. There’s no safety on a battleground. There is no safety, peace, love, and harmony in a distractive device that was designed to keep the mind not knowing who it really is, Spirit. Both The Matrix and The Truman Show point to the need to see the nature of our imprisonment. The reason it’s so important is that the solution can only be accepted after the problem has been identified exactly as it is and where it it. Otherwise, you’ll keep projecting it out to be in form and searching for solutions in form as well, and that delays the whole awakening. Watch this profound clip from the documentary,Philosophy and The Matrix - Return to the Source, along with David's comments. A Course in Miracles Chapter 11, "The 'Dynamics' of the Ego," is an invitation to look more closely at the ego thought system in order to dispel it. Watch this compellingYouTube about recognizing that the "dynamics" of the ego are mere delusions. This is one of the greatest faith, and “making the turn” movies ever! Alfred Jones insists he is a facts and figures man, and not at all a man of faith. Little does he know! Excerpt from new MWGE movie review. When the purpose of awakening is given to our life, we are tuning into the script through prayer and inner listening, and it becomes a vibrant, living experience. Excerpt from new MWGE movie review. Classic movies like The Truman Show, The Matrix, Groundhog Day and Inception are heralding the escape from linear time. If we can let the past be gone, then we are letting go of the linear aspects of the world, of the game. We've been thinking in linear terms and now we have to think quantum to see that the whole thing is simultaneous. That’s the only escape. We are not going to escape in the linearity because that’s the problem. When we consistently look through Spirit’s perspective, we can get into the joy of being; we can actually lose track of the passage of time. That’s the fun of this awakening experience. The Spirit deals with what we believe and what we perceive, and this is highly practical. As the Spirit works with us in this way, we find ourselves becoming detached from and disidentified with the world. We are not disoriented anymore; we feel no sense of confusion. We are everything that is, and in that realization there is a sense of glory. "In a spontaneous visit to an Akashic healer, I was told that, in order to heal any abuse in the mind, I would have to start writing movies. I laughed and thought it was absurd because the writing was the one thing I was waiting for others to do before I could make the movie. Turns out I was the one I was waiting for. How romantic!" Movies, movie making and speaking with movies are all part of Jason Warwick's calling. Read more about his adventures in movie script writing in this issue of the Living Miracles Newsletter. Hear Jason's commentary in The Truman Showmini-movie here. His website is also filled with inspiration about using movies for awakening. One of the readers to The Common Sense Show, provided me with a tip with regard to an advertised government position. The first reference to this concerning job occurs on Indeed.com and then the job seeker is redirected to usajobs.gov. The CSS reader asked me a question and I thought this sounded suspect and I subsequently investigated. Here is what I found which was the result of this accurate tip. When one follows the advertise of this FEMA position, one will observe the bolded SELECTIVE SERVICE Registration Requirement for the seemingly insignificant job of what looks like a glorified secretary position (i.e. administrative assistant). The United States suspended the draft in the mid-1970’s and I have literally looked at dozens of advertised federal jobs and not one of them had a mandatory selective service registration is required for males born after 12/31/59. Let’s compare this FEMA job advertisement to another sensitive job advertisement. The reader can see that the drill apparently, at least in part, kicks off at Camp Bullis, TX., on March 21 following a preliminary set of activities. Upon further investigation, it was quite clear that this administration was practicing for civil war. The “guerrilla actors” were quite obviously former US soldiers what had gone rogue and were waging a guerrilla war against the establishment. With regard to this article, I found it interesting that the UWEX 16 drill job advertisements contained no provision for all males to be registered for selective service under the age of 57, effective the end of this year. The nature of the FEMA ad is a sudden departure from past practices for advertising federal jobs. What is even more curious is that this FEMA job is temporary and will end in two years. This means that FEMA is going to be engaged in some activity requiring a temporary boost in administrative support personnel. The more savvy of you are already smelling a rat. For those that are waiting for the punchline, here it is. As yourself, what is FEMA’s mission. FEMA’s mission is to provide temporary services to people in distress in response to some kind of declared emergency. The term FEMA camp has become a well-known euphemism for tyrannical incarceration under the auspices of FEMA. Thus, the incarceration of Americans in FEMA camps would have to be the result of some kind of declared emergency, such as widespread civil disobedience/civil war. As I said, the more savvy of you already know where this is going. To the rest, you are no doubt wondering is there a connection to the dots coming in the near future? We have a couple of more variables to consider. It is very clear that various aspects of FM 39.4, of the Army Resettlement documents are very clearly associated with UWEX 16 in terms of how this playing out. As was the case with the NAZIS, slave labor will be a part of the landscape as evidenced by the following Army document. Commanders must organize and manage detainees in such a manner as to permit the proper and ready employment of each detainee. Establish and maintain a current occupational skill record for each detainee. Include new skills as they are acquired. Assigning individual detainees to a work detail or job on a regular or permanent basis. Establishing vocational training projects and encouraging detainees to study and develop needed skills to the maximum extent possible. Camp administration and installation maintenance. Public works, public utilities, and building operations that have no military character or purpose. Transportation and handling of stores that are not military in nature or purpose. Stop! The following may contain images and messages which are troublesome to those who suffer from cognitive dissonance and corporate media group think. What lies below is more proof that it will be foreign troops killing American citizens, not American soldiers who cannot be counted on to violate their oath to the Constitution. It is amazing that some still continue to deny the presence of foreign troops on American soil. It is clear that UWEX 16 will, in part, include slave labor as part of the forced incarceration of what presumably will be millions of Americans. Further, Executive Order 13603, also calls for slave labor in the camps. Let remind the reader that Jade Helm 15 was primarily about dissident extraction and incarceration, hence the use of special forces as opposed to conventional forces. UWEX 16 is about (1) dissident extraction (2) the quelling of any domestic civil unrest and (3) the obliteration of any American military unit that is not on board and opposes the subjugation of millions of American citizens. But wait, there is more. I noted an article on Steve Quayle’s site, yesterday, that speaks to who the possible foreign troops will consist of. Steve ran an article from NEWS Prepper which reported UN troops mobilizing in Virginia and Texas. In addition, I have received reports of Chinese military vehicles in So. Arizona. A subjugation for is being assembled. These forces are not here for training. They are here for you. But as they say in the informercials, there’s more. I always knew there was a reason that I hung on to my copy of Executive Order 13603 tha was issued by Obama in 2011. The day will soon arrive that we will understand why Obama issued this EO almost five years ago. If the above section was merely going to be a military draft, then the Secretary of Labor would not have to be involved. However, as you will note the “Secretary of Labor, in coordination with the Secretary of Defense and heads of other agencies, as deemed appropriate by the Secretary of Labor, shall… assist in the development of policies regulating the induction and deferment of persons for duty in the armed services;… formulate plans, programs, and policies for meeting the labor requirements of actions to be taken for national defense purposes; and (ii) estimate training. This matches, very closely what is happening, at this moment in Venezuela. Work has been considered by some to be kind of a home away from home proposition. Under EO 13603, it soon will be. Here is the most damning part : “The needs to help address national defense requirements and promote necessary and appropriate training programs…”. Refer back to section 502 of sections 710(b) and (c) of the Act, 50 U.S.C. App. 2160(b), (c); these are the people that the Secretary of the Labor will conscript in order “to employ persons of outstanding experience and ability without compensation and to employ experts, consultants, or organizations”. This, my fellow Americans, is a civilian conscription and this is why the Secretary of Labor is in charge instead of the head of the Selective Service! Under these provisions, the government believes that they can send you anywhere, to work on anything of their choosing. And adding fuel to the fire, why do you think that the Senate just passed a bill which requires females to register with Selective Service? Nobody is outside the system. It is not just the males below the age of 57 that must worry. I reported several weeks ago the Senate passed a bill requiring women to register for Selective Service upon turning 18. I have strong reason to believe that the previously referenced job ad is in regard to this endeavor. The job is temporary and the person must be registered for the draft. The job ad is conspiculously vague. Please do not forget that I authored an article in which I stated that the slave provisions of EO 13603 were being beta tested in Venezuela as I write these words. Therefore, we can conclude that the incarceration of Americans into involuntary servitude to the globalists is an equal opportunity endeavor in this modern day version of “No child left behind”. 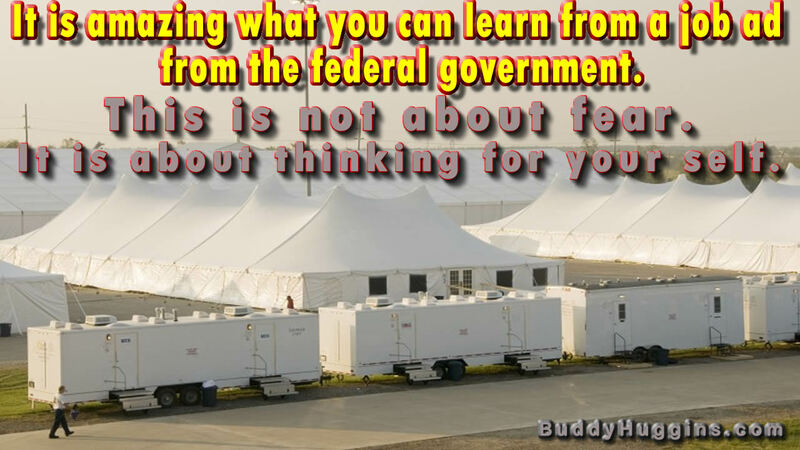 Within two years, millions of Americans will be incarcerated in FEMA camps. The enforcement agents, that I have written about for 8 years will be foreign and will operate under the UN flag. I knew the late special FBI agent, Larry Grathwohl, very well. We spoke on the phone often and he appeared on my talk show numerous times. Larry Grathwohl stated that the mass incarceration of Americans is the goal, on The Common Sense Show. Here is a video summation of what he repeatedly to my audience and myself in private conversations. Bill Ayers launched Obama’s political career. Hillary was to follow in Obama’s footsteps. At the time that Ayers said that he was prepared to arrest 50 million American, force them into re-education camps in the Southwest and that he was prepared to murder 50% of them, the country has grown by 40% in population. That means that in today’s numbers Ayers would be prepared to murder 40 million Americans because they could not be “re-educated”. It is amazing what you can learn from a job ad from the federal government.